Definition at line 18 of file CREMessagePanel.h. Definition at line 10 of file CREMessagePanel.cpp. 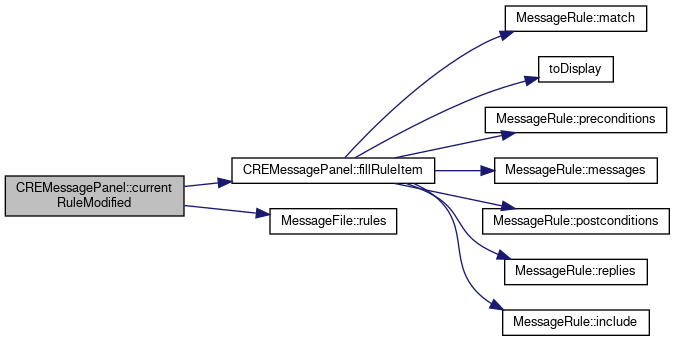 References currentItemChanged(), currentRuleModified(), main(), myLocation, myMessage, myMessageManager, myPath, myRulePanel, myRules, myUse, onAddRule(), onDeleteRule(), onDuplicate(), onMoveDown(), and onMoveUp(). Definition at line 82 of file CREMessagePanel.cpp. Definition at line 314 of file CREMessagePanel.cpp. References myLocation, myMessage, myPath, MessageFile::setLocation(), and MessageFile::setPath(). Definition at line 186 of file CREMessagePanel.cpp. 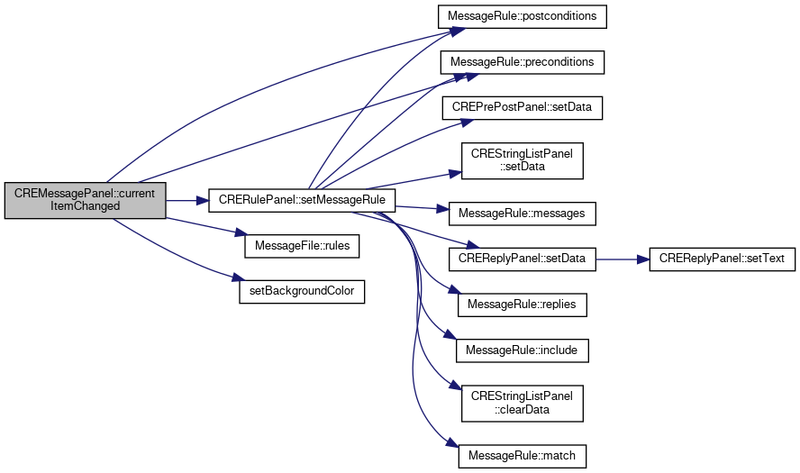 References myDefaultBackground, myMessage, myRulePanel, myRules, MessageRule::postconditions(), MessageRule::preconditions(), MessageFile::rules(), setBackgroundColor(), and CRERulePanel::setMessageRule(). Definition at line 278 of file CREMessagePanel.cpp. References fillRuleItem(), myMessage, myRules, and MessageFile::rules(). Definition at line 285 of file CREMessagePanel.cpp. References MessageRule::include(), MessageRule::match(), MessageRule::messages(), MessageRule::postconditions(), MessageRule::preconditions(), MessageRule::replies(), and toDisplay(). Referenced by currentRuleModified(), and onDuplicate(). Definition at line 295 of file CREMessagePanel.cpp. References MessageRule::match(), myMessage, myRules, MessageFile::rules(), and MessageRule::setModified(). Definition at line 304 of file CREMessagePanel.cpp. References myMessage, myRules, and MessageFile::rules(). Definition at line 352 of file CREMessagePanel.cpp. References fillRuleItem(), MessageRule::match(), myMessage, myRules, and MessageFile::rules(). Definition at line 336 of file CREMessagePanel.cpp. References myMessage, myRules, MessageFile::rules(), and MessageFile::setModified(). Definition at line 320 of file CREMessagePanel.cpp. Definition at line 94 of file CREMessagePanel.cpp. 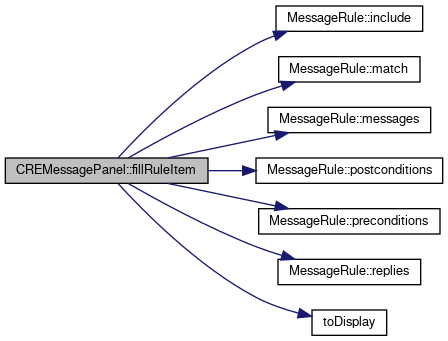 References MessageRule::include(), MessageFile::location(), MessageFile::maps(), MessageRule::match(), MessageManager::messages(), MessageRule::messages(), myDefaultBackground, myLocation, myMessage, myMessageManager, myPath, myRulePanel, myRules, myUse, MessageFile::path(), CREMapInformation::path, MessageRule::postconditions(), MessageRule::preconditions(), MessageRule::replies(), root, MessageFile::rules(), CRERulePanel::setMessageRule(), and toDisplay(). Definition at line 35 of file CREMessagePanel.h. Referenced by currentItemChanged(), and setItem(). Definition at line 33 of file CREMessagePanel.h. Referenced by commitData(), CREMessagePanel(), and setItem(). Definition at line 31 of file CREMessagePanel.h. Referenced by commitData(), CREMessagePanel(), currentItemChanged(), currentRuleModified(), onAddRule(), onDeleteRule(), onDuplicate(), onMoveDown(), onMoveUp(), and setItem(). Definition at line 30 of file CREMessagePanel.h. 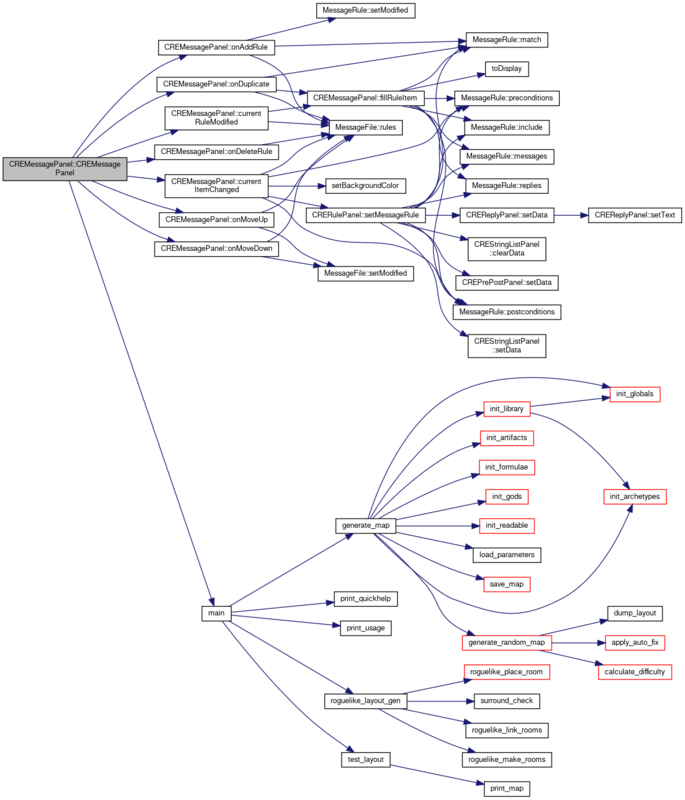 Referenced by CREMessagePanel(), and setItem(). Definition at line 32 of file CREMessagePanel.h. Definition at line 36 of file CREMessagePanel.h. Referenced by CREMessagePanel(), currentItemChanged(), and setItem(). Definition at line 34 of file CREMessagePanel.h. Referenced by CREMessagePanel(), currentItemChanged(), currentRuleModified(), onAddRule(), onDeleteRule(), onDuplicate(), onMoveDown(), onMoveUp(), and setItem(). Definition at line 37 of file CREMessagePanel.h.